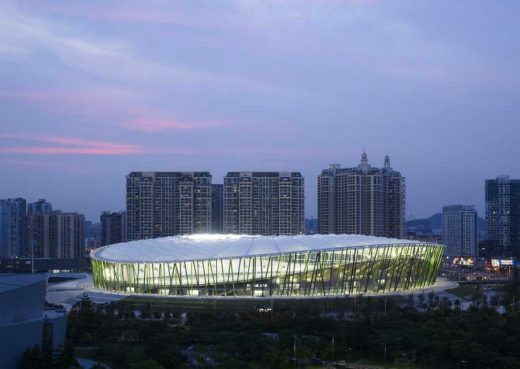 To mark the occasion of the Universiade, which will take place from 12th to 23rd August 2011, the Universiade sports center and Bao’an stadium will be opened tomorrow in Shenzhen, southern China. The international competitions to come up with a design for the buildings were won in 2006 and 2007 by the designs of architects von Gerkan, Marg and Partners (gmp). The Universiade sports center consists of a stadium, a multifunctional hall and a swimming pool. The stadium in the Bao’an district is designed as an athletics stadium. However, during the 2011 Universiade, it is being used for football matches. The design for the Universiade Sports Center in the city of Shenzhen is inspired by the surrounding undulating landscape and generates a formal dialog that references Chinese horticulture and philosophy toward the land. The roof structure projects up to 65 m, and is designed as a steel prismatic shell on a basis of triangular facets. The crystalline shape of the three stadia is additionally emphasized by the illumination of the translucent facades at night. An artificial lake connects the stadium with the circular multifunctional hall in the north and the rectangular swimming hall west thereof. 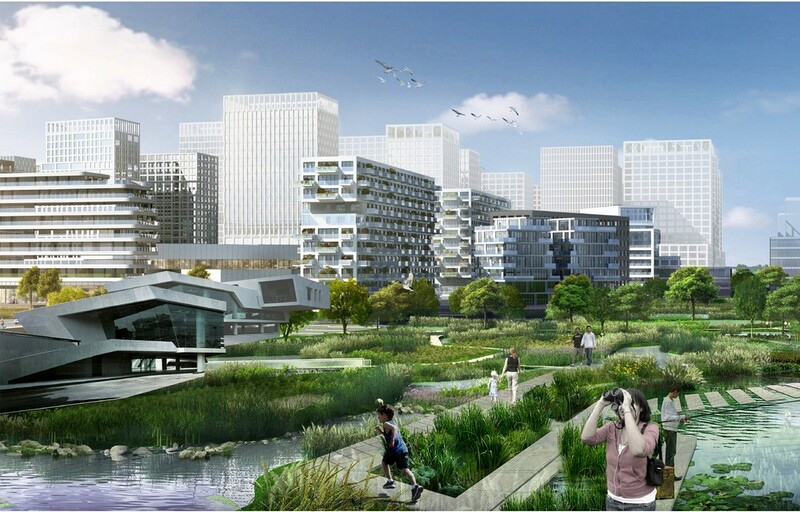 The central sports plaza is accessed via a raised promenade from the individual stadia. The main stadium is planned to be multifunctional, meeting the requirements of international sports occasions and events. Total capacity is 60,000, seated in three stands. The total diameter of the roof is 310 m lengthways and 290 m across. The indoor sports complex is designed as a circular multifunctional arena for indoor sports competitions as well as for ice-skating and other events. The overall capacity is approx. 18,000 spectators. The swimming complex forms the third module of the Shenzhen Universiade Sports Center. The overall capacity is approx. 3,000 spectators, the seats are arranged on two stands. 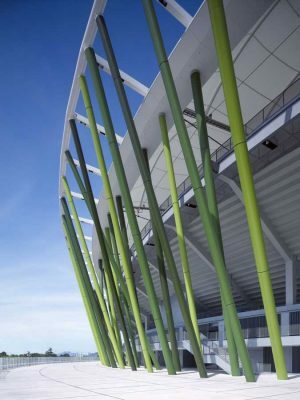 The image of a bamboo forest is created by the double row of steel supports, where every other in the inner row is connected with the concrete structure of the undulating upper tier, thus carrying the vertical loads of the spectator seating. The steel tubes, which are up to 32 m in length, range from 55 cm to 80 cm, varying in accordance with their differing static loads. A membrane roof suspended from an outer frame was selected to cover the seating areas. 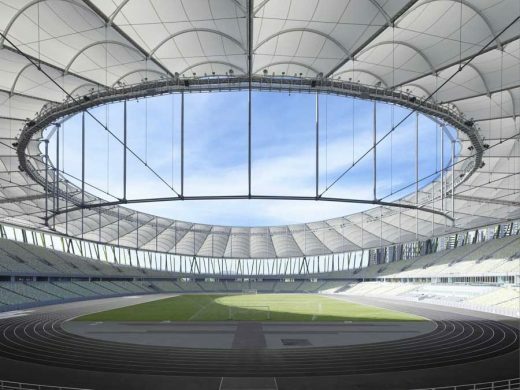 With a diameter of 230 m and cantilevering of 54 m on each side of the stands, the roof is carried by 36 pairs of cables whose pretensioning is brought together via a circular double tension ring of strand-bundle cables above the pitch. 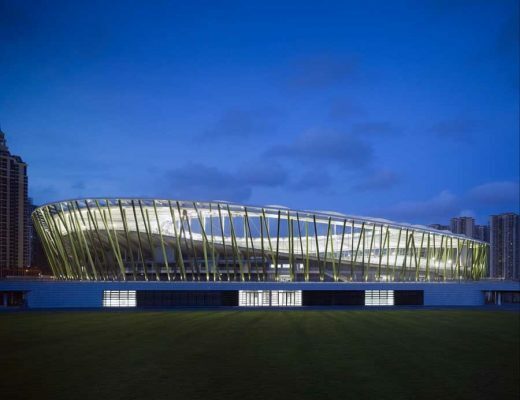 The stadium is designed to hold a capacity of 40,000 spectators.